Owner Paul Elio stands next to Elio Motors' new three-wheeled vehicle. Photo credit: Elio Motors. Elio Motors has developed a fleet sales division to capitalize on growing interest from rental companies, businesses and municipalities. In 2015, Elio Motors is launching an enclosed, three-wheeled vehicle that will retail for $6,800 and get 84 miles per gallon. This vehicle can provide cost-savings to companies and government entities that have fleets for rentals, deliveries, service calls and other travel-related needs, says the company. Assuming a vehicle gets 25 miles per gallon and is driven 20,000 miles at $4 per gallon of gas, switching to an Elio could save a company nearly $2,250.00 annually on fuel costs, according to Elio Motors. The fleet sales division will be headed by Brendan Carey, a former employee for ADESA auctions who joined Elio Motors in 2013. 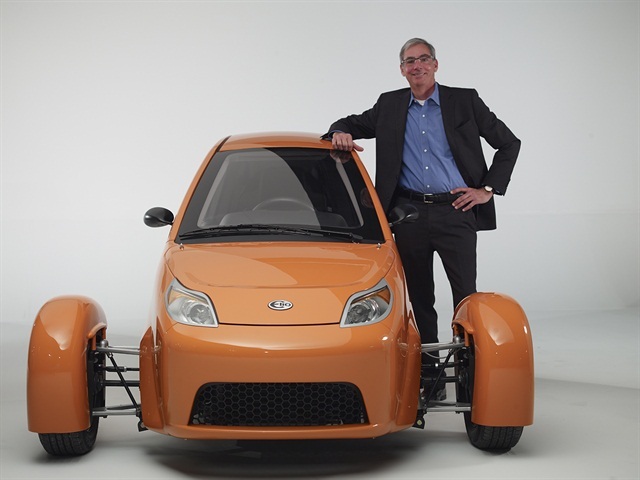 Though Elio Motors launches in 2015, it is currently taking reservations. For more information, visit www.eliomotors.com.